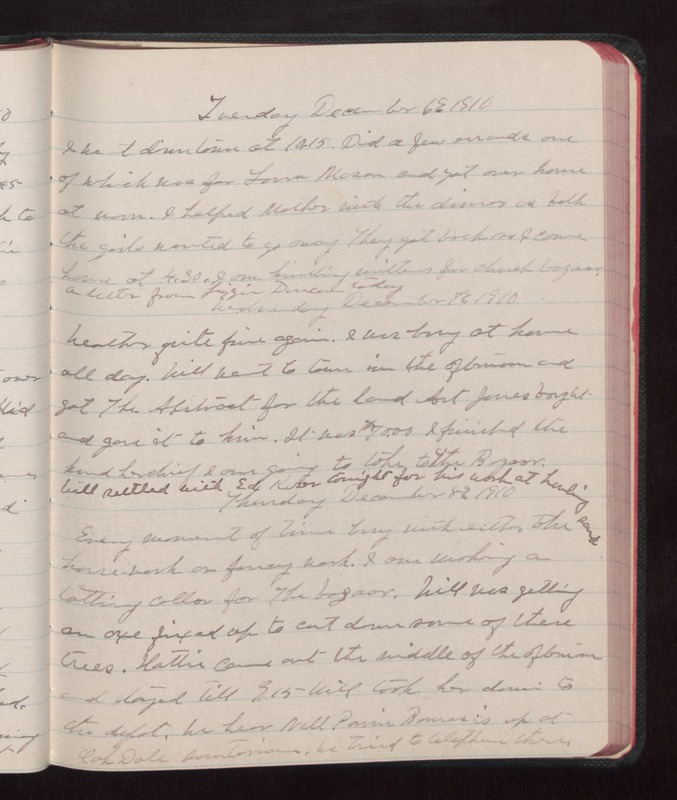 Tuesday December 6 1910 I went down town at 10.15. Did a few errands one of which was for Lorna Mason and get over home at noon I helped Mother with the dinner as both the girls wanted to go away They got back so I came home at 4.30. I am knitting mittens for church bazaar. A letter from Lizzie Duncan today Wednesday December 7 1910 Weather quite fine again. I was busy at home all day. Will went to town in the afternoon and got The Abstract for the land Art Jones bought and gave it to him. It was $7000 I finished the handkerchief I am going to take to the Bazaar. Will settled with Ed [Kevor?] tonight for his work at hauling sand Thursday December 8 1910 Every moment of time busy with either the house work or fancy work. I am making a tatting collar for the bazaar. Will was getting an axe fixed up to cut down some of these trees. Hattie came out the middle of the afternoon and stayed till 9.15 Will took her down to the depot. We hear Nell [illegible] [illegible] is up at Oak Dale [illegible]. We tried to telephone there.